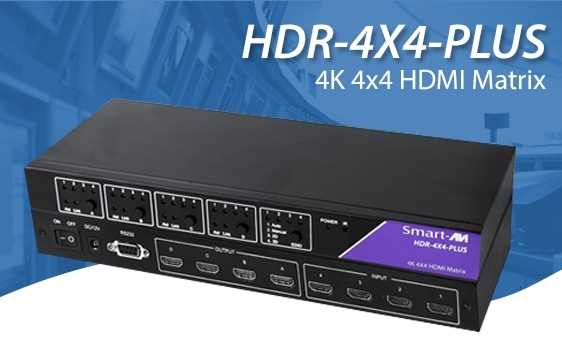 The updated HDR-4×4-Pro by SmartAVI is the ideal solution to manage and distribute four HDMI sources to four HDMI displays with up to 325 feet of signal extension. With the HLX-500-RX receiver at each end point connected to the matrix by inexpensive Cat5e/6 cables, users can extend HDMI signals with 1080p resolution up to 325 feet. This reliable extension capability breaks the distance barriers that restrict HDMI cables. 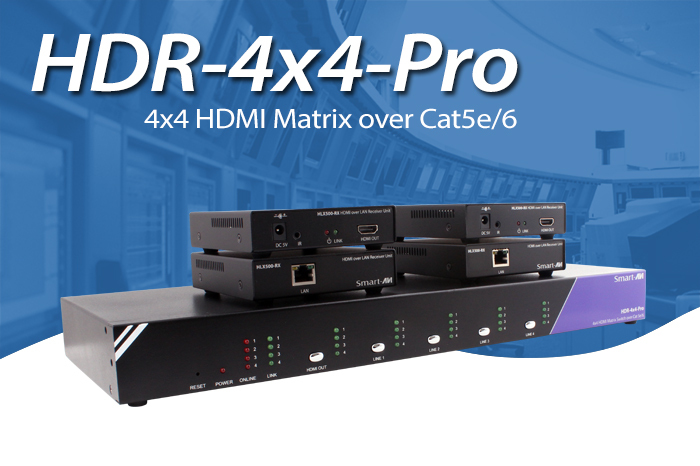 The HDR-4×4-Pro offers flexibility and convenience in signal management, including a local HDMI output and control via the front panel switches, infrared and RS-232. This new device is overhauling the old challenges of HDMI matrix routers, and it’s easy to install and operate. Categories: hdmi, hdmi audio, hdmi matrix, hdmi switch, video, video switch | Tags: hdmi, hdmi extender, hdmi matrix, hdmi switch, technology | Permalink. From the boardroom to the classroom, giving a presentation that involves video and audio requires easy connectivity to a wide variety of A/V hardware. 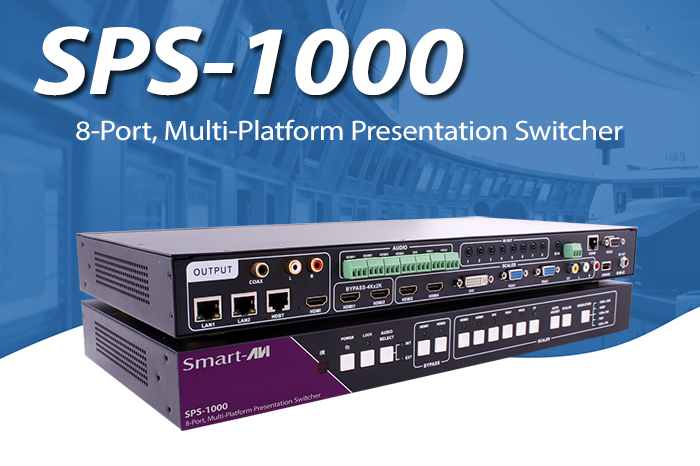 The new SPS-1000 Smart Presentation Switcher from SmartAVI delivers eight input ports and gives users a variety of ways to connect to an HD display. With HDMI, VGA, DVI and RCA ports, users can quickly connect and switch between eight sources at once, from PCs to mobile devices, and virtually everything in between. 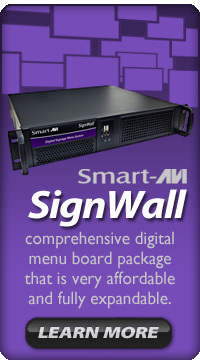 The SPS-1000 is an absolute must-have device in any meeting room. 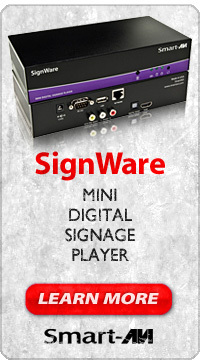 Categories: 4K Ultra HD, Audio, digital signage, dvi-d, hdmi, hdmi switch, presentation switcher, video, video switch | Tags: 4K, board presentation, dvi-d, hdmi, hdmi converter, hdmi extender, hdmi switch, rs232, technology, video switch | Permalink. 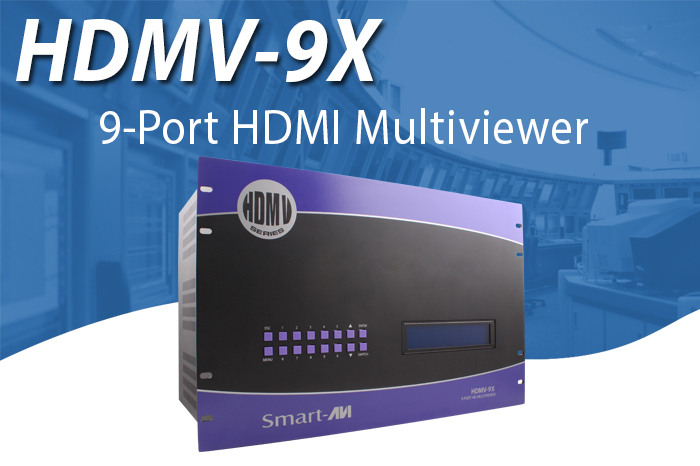 To view the latest in HD video signals, including live HDTV broadcasts, camera signals, computers, Blu-ray DVDs and more all on one screen, the newly updated HDMV-9X provides the best multiviewing capabilities on the market. This aggressively-priced addition to our popular HDMV series multiplies the amount of available HDMI inputs users can view at one time. The the HDMV-9X is easy to install and implement, and it requires no additional computers or software. With multiple screen layouts – including all nine sources displayed at once – and several switching options, users can create the ideal multiviewing set up on the fly. It has never been easier to monitor and manage so many HDMI video sources at once! Categories: hdmi, hdmi switch, Multiviewer, rs232, video | Tags: hdmi, HDMI multiviewer, hdmi switch, multiviewer, technology | Permalink. 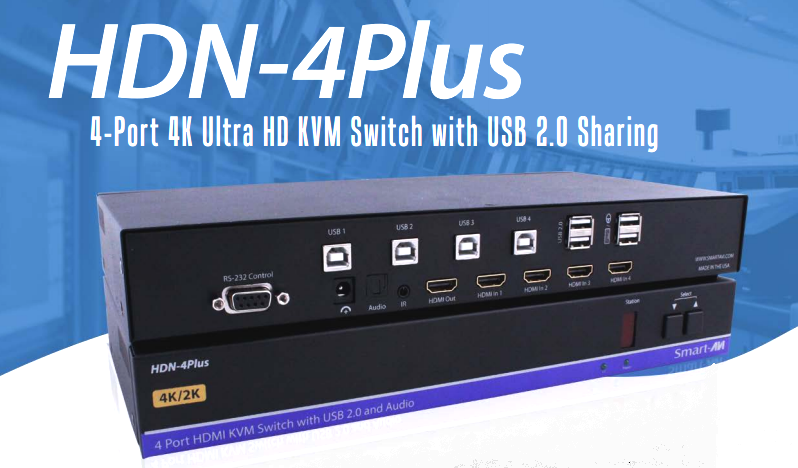 The First HDCP Compliant 4K Ultra HD KVM is Here! Categories: 4K Ultra HD, hdmi, hdmi switch, keyboard video mouse, kvm, Multiviewer, rs232, Uncategorized, usb 2.0 | Tags: 4K, hdmi, keyboard video mouse, kvm | Permalink. As 4K content and displays increase in popularity, SmartAVI is focused on developing affordable pro A/V products that deliver stunning 4K Ultra HD resolution. To go with our recent 4K digital signage players, 4K video wall controllers and 4K extenders, we’re proud to release the new HDR-4×4-Plus, a 4×4 HDMI matrix with support for stunning 4K video resolution (3840×2160 @30Hz). SmartAVI also offers a variety of other 4K-ready products that will enable you to get the most out of your new 4K screens. This new, expanded resolution offers four times the video quality you’ve enjoyed with 1080p. 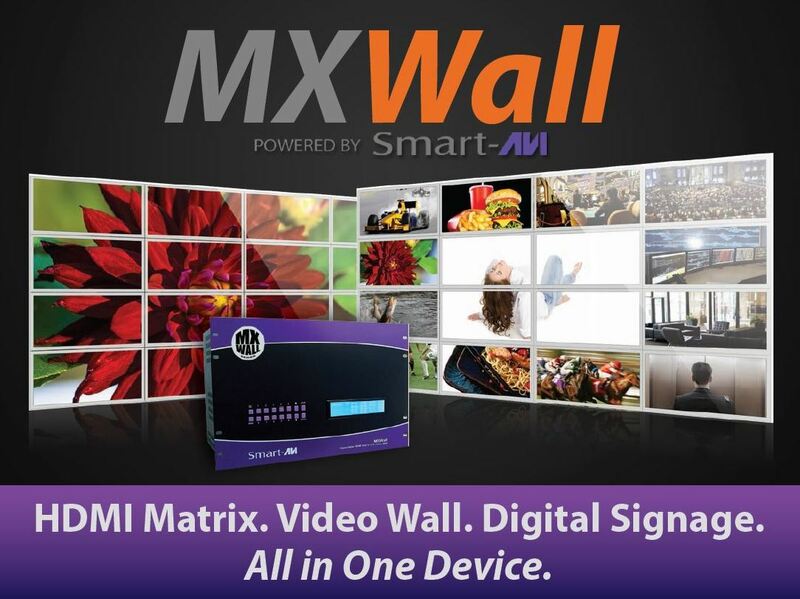 4K is quickly becoming the new industry standard for video broadcasting, so be sure to get the A/V routing and management products you need from SmartAVI to handle this exciting new technology! The HDR-4×4-Plus is now available for only $799. For more information, click here! Categories: 4K Ultra HD, digital signage, hdmi matrix, hdmi switch, video switch | Tags: 4K, hdmi, hdmi matrix, hdmi switch, video switch | Permalink. 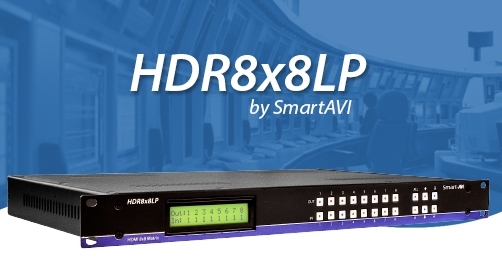 With a slim design and affordable price tag, the new HDR8X8LP provides top-quality HDMI matrix switching functions with eight HDMI inputs and eight HDMI outputs. End users and systems architects alike will appreciate the user-friendly operation this space-saving device delivers, and the low price makes it even more attractive. The HDR8X8LP from USA electronics manufacturer SmartAVI provides HDMI output up to 40 feet with resolutions up to 1080p. The matrix works with Blu-ray players, PCs, cable and satellite boxes, and other devices with an HDMI output. 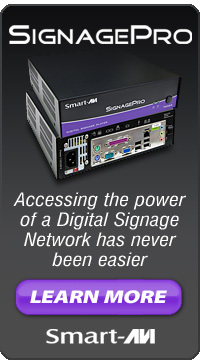 This affordable video matrix takes up just a single rack unit, making it easy to implement in a wide variety of environments. Users can control the device remotely with the optional internal network add-on. At only $2,199 ($2,299 with optional internal network), this 8×8 HDMI matrix delivers top-quality video and impressive value. For more information, Click Here! Categories: hdmi, hdmi matrix, hdmi switch | Tags: hdmi, hdmi matrix, hdmi switch | Permalink.